So you’ve planned your schedule, gotten your tickets, and planned your waiting strategy for the line-ups. You are all set! Except for that rumbling in your belly – the reminder that even the most hard-core film-goer needs to eat. Of course it can be difficult to find time for food when you are running from line to line, especially when certain venues don’t allow food inside. But a person’s gotta eat. There is certainly no shortage of dodgy hot dog vendors and gourmet food trucks in the city, and Google Maps will help you find all of the Starbucks within walking distance of the theatres, but the red carpets everywhere also inspire elegant eating. It’s been a long-standing tradition for Chantelle and I to have (at least) one Fancy Dinner per festival, to best celebrate our favourite time of year. And because we do nothing in half-measures we also make a point of choosing restaurant venues that are most likely to also net us some celebrity sightings. We’d like to share those secrets with you, because the more the merrier, and everybody’s gatta eat! It wasn’t that long ago that the festival lived in Yorkville, and there are more than a few people (us included) who don’t want to let go of that tradition. It’s still where a lot of the stars stay and some restaurants endure in popularity because a celebrity had a great experience there once long ago. Venue Details: Wonderful heated patio area, delicious dishes from Mark McEwan. It’s on prime real estate so you may see famous people walking past, or be seated nearby them. This was the location of Fancy Dinner 2009. Venue Details: Bistro-style cuisine with a super stylish interior. The tables are tiny, so if you ended up sitting next to someone impressive it would be pretty intimate quarters. This place fills a void left by the closure of Bistro 990, and according to last year’s Toronto Life’s Insider’s Guide to TIFF it’s gotten some heavy attention from Joaquin Phoenix. We featured it during Winterlicious last year. Don’t those pics make you hungry? 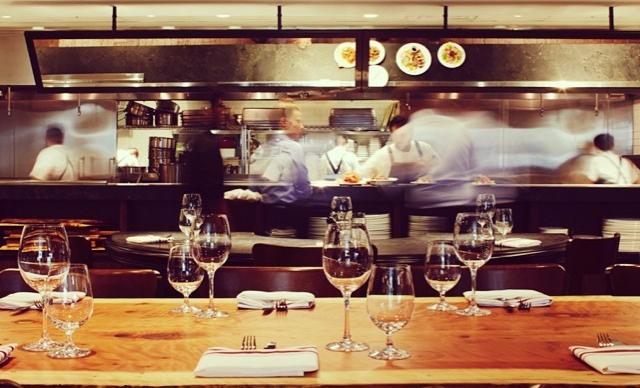 Venue details: Sure to draw in the Miami and NYC-based crowds who know and love Boulud’s menu style. It’s semi-casual but gorgeous and the food is some of the best you’ll have. It has the benefit of being right in the Four Seasons and it’s a safe bet that some of the hotel’s VIPs will venture into the dining room for some comforting eats. This was the location of Fancy Dinner 2013. Venue details: Another perfectly situated patio, in (as they say) the heart of Yorkville. 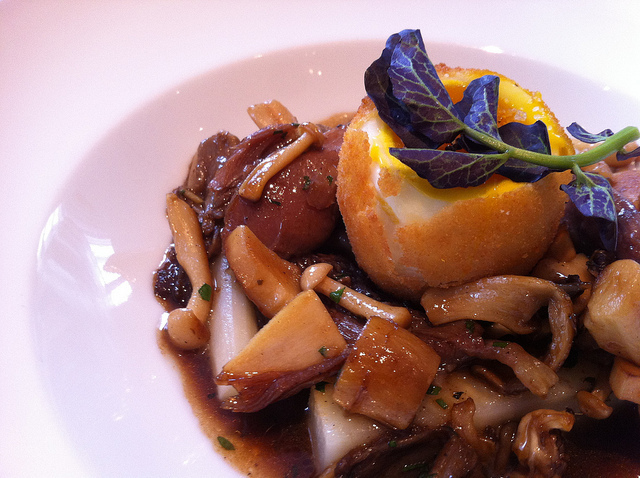 Swanky French food and superb service. This was the spot for our Fancy Dinner 2012. Venue Details: Although no confirmation yet that this outpost will be open in time for the festival – we suspect that it’ll play host to at least a few special events. Venue details: Right in the Lightbox, and overlooking King West, this place is as nouveau-TIFF as you can get. They tip their imaginary hat to TIFF by offering a speedy prix fixe for people off to a show, and film-themed cocktails. If you’re seeing anything at the Lightbox then this is where to dine. This was our spot for Fancy Dinner 2011. Venue details: Way more casual, lots of patio space. It’s a great place to watch filmgoers file into the theatres, but also to keep an eye out for directors and stars heading in for their Q&As. 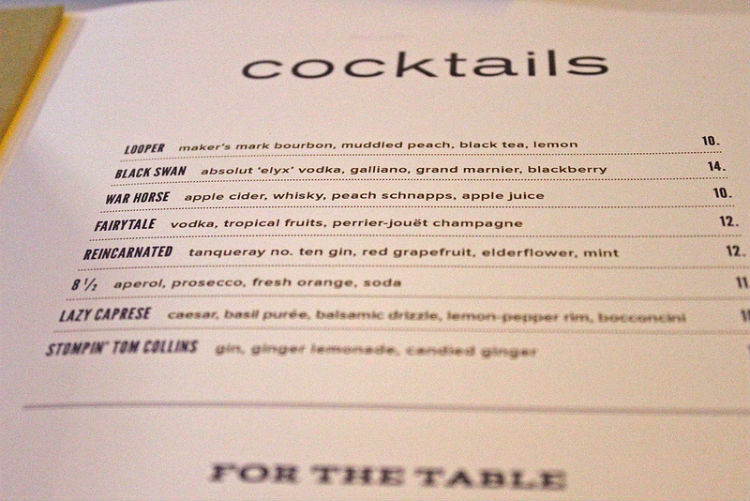 Ivan Reitman Inspired Menu by Johnathan Waxman at Montecito – a TIFF collaboration. Venue details: Abutting the Lightbox itself, Montecito will share with us gorgeous Californian-style cuisine (inspired by Canadian ingredients) from chef Jonathan Waxman. Also exciting to note is the owner – director Ivan Reitman! Can you find a better film/food combination that that? For more information and images be sure to visit this Toronto Life article. While we haven’t personally had the pleasure of dining here yet it is our goal to make this the site of Fancy Dinner 2014. Wish us luck! Venue details: Multiple floors, each with a different style and menu. The Momofuku restaurants are beloved in New York and have made a new home in Toronto. David Chang is now a fixture in our dining culture, and we can hope that some Manhattanites will be drawn in by its familiarity. We also have Milk Bar now, if you want to try to smuggle a slice of Crack Pie into a movie. Of course it is pretty darn hard to predict where the trendmakers will go this year, and hotspots only last so long. So my advice is to make a reservation if you can (you’ll be waiting in enough lines as it is), order the most delicious things that you can, and not to sweat it if 2014 doesn’t see you dining with the stars, you could always, with the help of our next guide installment, catch them on The Red Carpet. 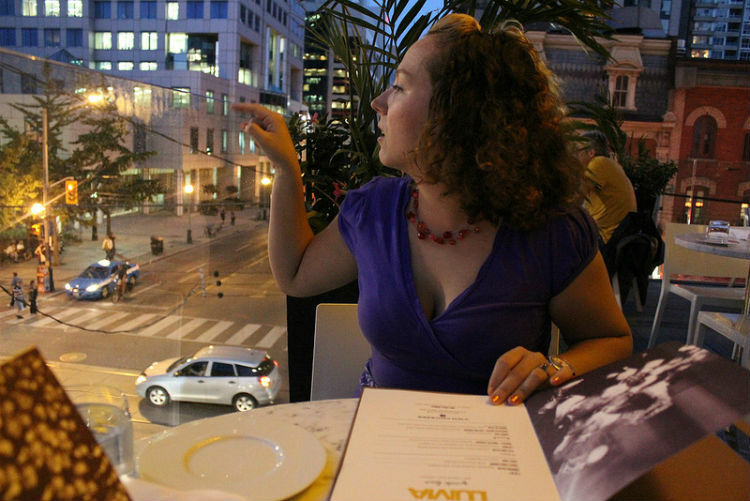 Luma, in the Lightbox, overlooks King West and two major Red Carpets. For more TIFF Tips on Tickets, Venues, Restaurants or Celebrity Spotting, click the banner below!